So Mr Tonic, the mini-Tonics and myself recently moved (we used Platinum Removals and they were FAB - Read these reviews). We bought a beautiful federation house on Sydney's Lower North Shore 6 short years ago, turned it into a home - hello blood/sweat/tears (not mine, Mr Tonic's), sold up, moved out and are ready to tackle the next one. We're currently renting a very "rustic" house in the next suburb, and I just wanted to share a little corner of the living room. I hope there will be more....! Thanks for the little peek at your new place! And we love the little corner! Am off to Sweden tomorrow. Done packing and am just one final cup of tea away from bed. Thanks again for filling in for me whilst I am gone. I look forward to seeing what you cook up. 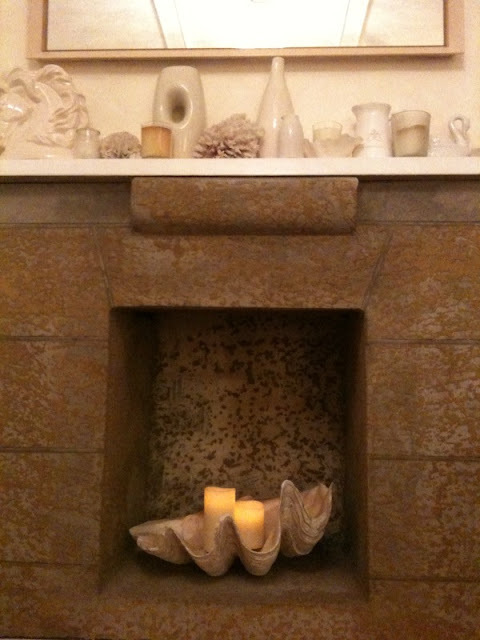 Very cool fireplace, and I love big clam shells!